Spring has sprung which means it's time to bring out the sandals and sunglasses. 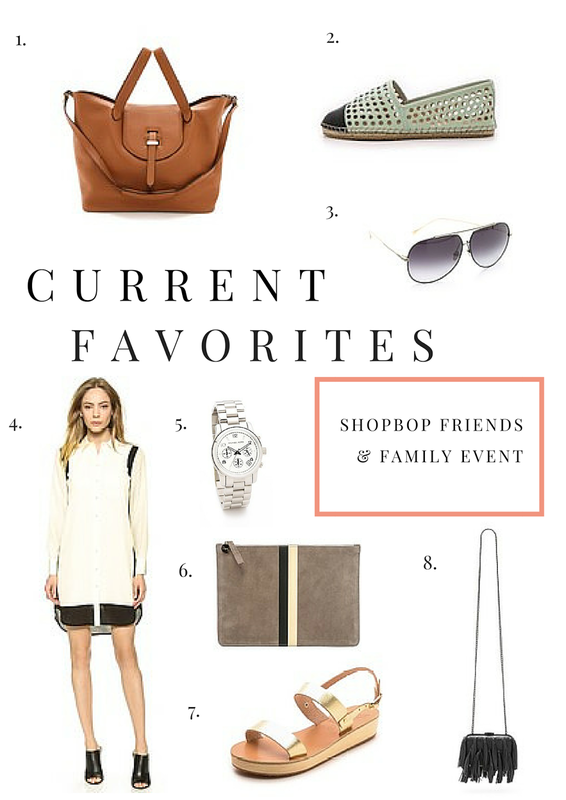 If you need to step up your wardrobe game Shopbop is having their Friends & Family event where you can save 25% off your purchase with code SPRING25. The sale starts today and ends April 10 (at 4AM EST) so don't wait to stock up on some spring essentials. 1. This meli melo handbag is a classic that will never go out of style. 2. Espadrilles are a must for spring and I love these from Loeffler Randall. 3. You can't go wrong with aviators like these from DITA. 4. I'm obsessed with shirt dresses this season and this option from Vince is my favorite. 5. Silver is a major trend in jewelry and I have my eye on this Michael Kors watch. 6. This lovely Clare V. clutch would be perfect for spring/summer days. 7. Pair these gold Ancient Greek Sandals with a skirt or skinny jeans this spring. 8. I'm all about tassels this spring and this Loeffler Randall bag is gorgeous.